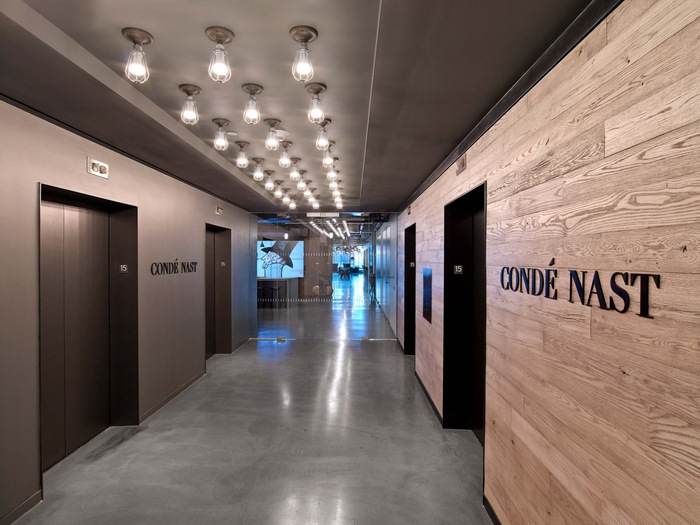 TPG Architecture has recently designed the new offices of Condé Nast Entertainment located in New York City, New York. When TPG Architecture first began working on the Condé Nast Entertainment (CNE) project in 2013 at 222 Broadway in New York City, the designers were given the mandate to create a space that was comfortable, homey and would allow for long work days and nights. The second piece of information that was relevant to the design was implicit, not stated directly: that CNE is one of the fastest-growing division of Conde Nast’s business, with expected growth in employees, revenues, services and product offerings in the next three years. With that knowledge in mind and given that Condé Nast had signed a lease for three floors (15, 16, 17), totaling 83,000 square feet, TPG Architecture designed offices that include not only desks, but also many other spaces to work and hang out: welcoming common areas with couches and upholstered chairs, lounges, kitchens, casual meeting spaces and many kinds of conference rooms. Open breakout spaces lend flexibility to a fast growing company. Walking through the space there’s a feeling of fluidity, mobility and flexibility, in large part because these transitional workspaces cater to not only the full time staff (most of whom work from a laptop) but also to a large cadre of freelancers and other consultants. With 20+ conference rooms spread out over the three floors and private offices and meeting spaces on the perimeter, pretty much every space has either writeable chalkboard walls or whiteboard to encourage spur of the moment creativity. The living rooms and phone rooms were painted with chalkboard paint, and the conference rooms and offices have whiteboard. Connectivity was a critical element to this design project.